Like Suse MacDonald's Alphabatics, an innovative book to stimulate the visual imagination. 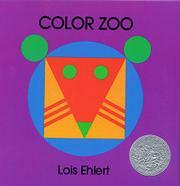 Ehlert uses apertures through sturdy paper to transform her boldly constructed images: a circle containing a symmetrical pattern--composed of red, orange, and green triangles and circles--believably represents a tiger's face; turning the page to remove the circular hole (labeled "circle" on the other side) reveals the same pattern with new ears, now a mouse; the next page turn (square hole) transforms mouse to fox; and at a third page turn, the three shapes used so far are collected and labeled again. Two more sequences add other animals and shapes, including octagon, hexagon, heart, and oval (unfortunately, neither egg-shaped nor an ellipse but a round-ended, straight-sided figure). All the figures formed, as well as the shapes and colors used, are recapitulated on the last three pages. Exciting use of design and color; an intriguing way to introduce or reinforce concepts of shape and color.